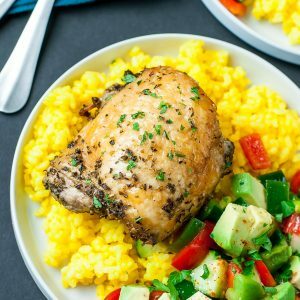 Baked to crispy perfection, these tender chicken thighs are seasoned with a homemade Mediterranean marinade and served with vibrant garlic turmeric rice. This simple weeknight dinner is easy to throw together and full of flavor! Whisk together oil, vinegar, basil, oregano, thyme, salt, and pepper. In a ziploc bag, combine marinade and chicken thighs and shake to coat. Marinate (in the fridge) anywhere from 30 minutes to 1 day (see note below) - the longer it sits the better the flavor! Remove chicken from refrigerator and allow to rest. Line a rimmed baking sheet with foil and spritz/drizzle with olive oil to prevent sticking. Use tongs (or a fork!) to remove the chicken from the bag/marinade and arrange on the baking sheet. Place on the center rack of the oven and bake for 25-35 minutes (depending on oven temperament; cook thighs to an internal temp of 165 degrees F) then switch oven setting to broil for a few minutes, until skin is golden and crispy. This will take around 2-4 minutes max. While the chicken roasts, cook your rice. They'll be done around the same time, woot! Bring a pot of water or broth to boil, then add your rice, turmeric, garlic powder, and salt. Stir, then reduce heat to low/simmer and cook, covered, for 20 minutes. I left a range for the rice seasoning to get you started. I added the larger amount of each but decided to give a range so you can season to taste. Start with a little and then add more, tasting as you go. The turmeric lends fantastic color, a mild flavor, and great health benefits while the garlic powder and salt punch the flavor up a bit. It's a hit with my entire family! Once your rice is cooked, fluff with a fork then add a little butter and any additional seasoning to taste. Serve chicken and rice alongside your favorite salad and enjoy! Garlic obsessed? Feel free to add 1 clove, minced to the marinade if you'd like a punch of garlic flavor! Totally optional. Serve with a simple veggie salad. I love combining chopped avocado, tomato, cucumber and peppers with a drizzle of oil and vinegar and a pinch of salt and pepper. Click HERE for the recipe! In a pinch you can marinate the chicken for 30 minutes or so. If you plan a little, whisk it together and start the marination process that morning or, better yet, marinate your chicken the night before. I've had best results tossing it together while I'm prepping dinner the night before, and then baking the chicken for lunch or dinner the following day. Delicious! Recipe yields 4 proper servings but can easily be devoured by two hungry adults when the mood strikes. If you manage to squirrel some away for later, the leftovers are fantastic too!